Peraton is one of several new competitors that has emerged from the recent wave of M & A activity as a Veritas Capital property in April 2017. The company’s previous identity was the IT services business from Harris Corporation. After some months as the company with no name, they were re-born as Peraton. Peraton is a privately-owned company held by Veritas Capital. Peraton was created out of the former government IT services division of Harris Corporation. 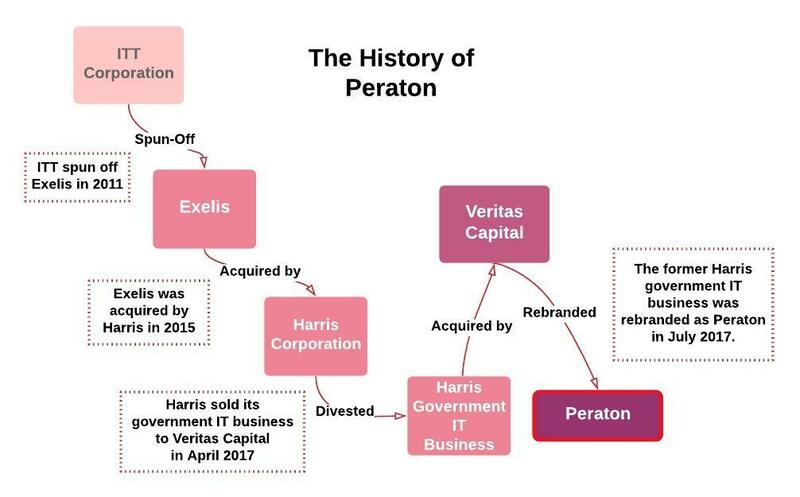 Tracing further back, the Peraton spin-off also includes the legacy ITT Exelis business that was acquired by Harris Corporation in February 2015. How did Peraton come into being? Let’s take a look. Figure 1 – Follow the bouncing ball as you go through the M&A chain to get to Peraton. In April 2018, Peraton acquired the Strategic Resources International, a provider of mobile and communications services. This 40-person company is currently the only acquisition that the company has made since starting as Peraton. Like many other large spin-offs, Peraton has a handful of key large contracts that define its portfolio. This is a tender time for spin-off businesses to gain momentum beyond legacy business. Many of its large contracts are coming up for recompete, and the fate of the follow-on awards may determine how Peraton fares in the near-term. NASA Space Communications and Network Services (SCNS) – The company has received $1.3 billion on this contract, which was originally awarded to legacy ITT corporation in 2010. This is the core of Peraton’s NASA portfolio. It recompeted as NASA SENSE, which was solicited earlier this year. U.S. Department of State, Bureau of Consular Affairs Services Support (CASS) – This is another crucial re-compete for Peraton, which has a likely final value of $134 million on the bridge contract. This contract provides development, installation, training, and hardware, software, and infrastructure support for all Consular locations worldwide. While the CASS bridge is currently slated to expire in February 2019, the follow-on Service Delivery, Outreach & Operations (SDO2) procurement is likely to be delayed (again). U.S. Army Wideband Satellite Communications Operations and Technical Support (WSOTS) – is yet another major Peraton contract nearing its due date. This $121 million contract, originally awarded to legacy ITT Exelis, supports US Army’s wideband satellite operations centers and management sites worldwide. The RFP for WSOTS II was released in June of this year. What other contracts define(d) Peraton? Outside of the critical recompetes reviewed above, here are some other contracts that help to define Peraton’s capabilities. Some of these are more in the rear-view mirror than anything else. Peraton inherited a collection of Seaport-e task orders from legacy Exelis. These task orders include a $107 million obligation for fleet systems engineering in support of the Navy Fleet Readiness Directorate, as well as a $50 million obligation to provide range instrumentation services for the Pacific Range Support Team for the MDA. NASA JPL Jet Propulsion Laboratory subcontract for Deep Space Network (DSN) Operations and Maintenance – Won and announced in July 2013, the 10-year, $435 ceiling value contract remains as steady backlog in the Peraton portfolio. 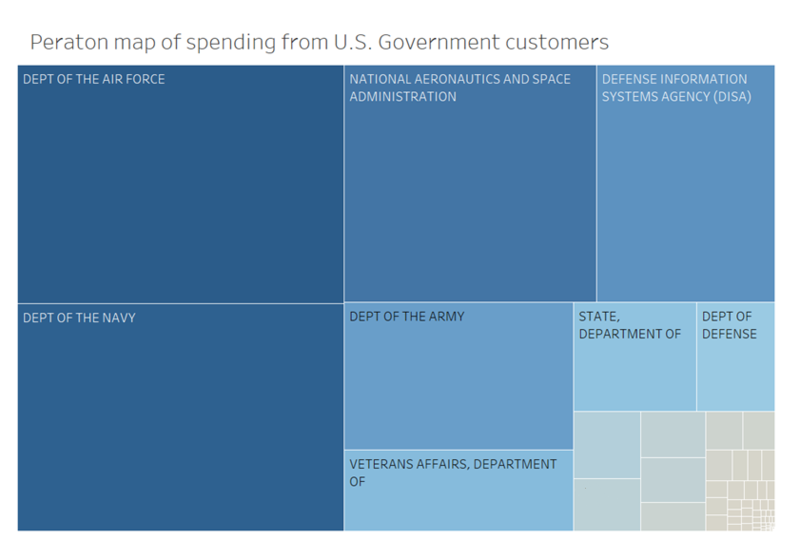 U.S. Air Force (legacy) Network and Space Operation and Maintenance (NSOM) contract – The company realized $410 million in revenue over 8 years of contract support. In 2016, Peraton’s contract ended and the follow-on Control Network Modifications, Maintenance and Operations (CAMMO) contract was awarded to CACI. NORAD and USNORTHCOM Information Technology Service Management (N2ITSM) support contract – This is another part of their U.S. Air Force legacy. The former segment of Harris (tied into Peraton) had been obligated $91 million over the contract’s 5-year period of performance. In January 2017, the N2ITSM follow-on contract was solicited as a small business set-aside and awarded to S4, Inc.
Peraton has been creating some foundation for its future with some recent wins and some contract vehicles. The company recently won a spot on the $207 million ceiling value HHS IT Services BPA to provide lifecycle support for all current and future HHS systems. Peraton is one of six companies on the BPA, other awardees include ActioNet, CSRA, Leidos, NuAxis, and SAIC. Peraton is also one of 14 awardees with a spot on DISA’s $7.5B value Systems Engineering, Technology, and Innovation (SETI) IDIQ. While there is not yet any significant work on this newly awarded vehicle, SETI may be an opportunity for Peraton to demonstrate and strengthen their work in engineering and emerging technologies. If you think you’ve had it rough with the TSA, you haven’t experienced what happened with Peraton. On May 31, 2018, Peraton’s contract to sustain TSA airport security equipment was terminated and operations were passed back to the legacy incumbent Leidos. This $578 million ceiling contract would have been the company’s largest non-recompete win. Few publicly confirmed details are available around the termination. Peraton is a large and hungry competitor that has to get some big wins and soon. GOVCON incumbents beware. They’re coming for you.